Robert Rich & Markus Reuter are well-known for their many musical journeys - from the back of beyond to the brink of the mainstream. 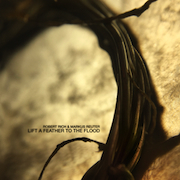 On Lift a Feather to the Flood (66'00") they mainly explore tonality, and many of its subtle shades and moods. With Rich at the grand, and Reuter breathing out atmospheres and textures from his touch guitar and synth, this duo realizes eight subtle thought zones meant for pondering and questioning - more so than assurance and confirmation. On Lift a Feather to the Flood we do find the dignified, stately procession of reverberant piano notes walking thoughtfully through a cloudy haze of digital mist. But the most potent pieces are made with an ear for light, motion and surface - compositions that we must reason our way through. It is in these deepest moments that we may feel this album's personal tone. As they work in this unique frequency, using melody and harmony likes signs and symbols, Rich & Reuter lean into the Avant-Garde. 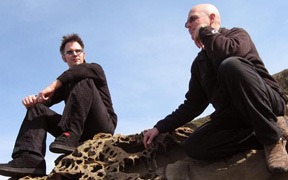 Locating tone is their mission, and the production of these rarefied ambient zones touches a distinctive, inquiring energy, and maybe even a bit of our fear of the unknown. This work does seem to be searching, just for the stimulation of it - with Rich & Reuter sharing their deep wondering about music, humanity and life. This duo knows about this music's secret mind, and in their dreamy, drifting, lulling, pulling sonics, we approach something like the actual flow of consciousness.